Paris closed out 2014’s Fall/Winter runway shows with impeccable lines from fashion powerhouses Givenchy, Chanel, Gareth Pugh and Vivienne Westwood. The Untitled Magazine presents some of our favorite moments from Paris Fashion Week! Vivienne Westwood, in all of her quirky glory, presented a line that was actually realistic for normal women! Aside from the face paint on the models, the clothing was pulled together and could easily walk straight off of the runway and onto the streets of Paris. It’s to be noted that ever since Pharrell showed up at the Grammy Awards (and to the Oscars) in Westwood’s now infamous hat, the designer has been receiving exponential amounts of attention and her extra-over-sized hats shown in Paris are sure to be a hit. As we pointed out in over coverage from Milan Fashion Week, menswear and furs are “in” for Fall and Paris has joined the bandwagon! Givenchy gave us menswear joining the ranks of Badgley Mischka, Charlotte Ronson and Rag & Bone – all of whom presented immaculately tailored pants and blazers for the upcoming season. Gareth Pugh‘s line may not have been as ‘ready-to-wear’ as others but it was a nice change of pace for the rather refined runways in Paris. The designer’s use of innovative textiles and fabrics stood out as one of the most creative shows of the season alongside one of our favorite’s Manish Arora. There is no doubt that these haute looks from Paris push the envelope of avant-garde textiles for fall. Karl Lagerfeld, who was once quoted saying that sweatpants are a sign of defeat, did a complete 180 and had models walking down the runway in sweats and sneakers. 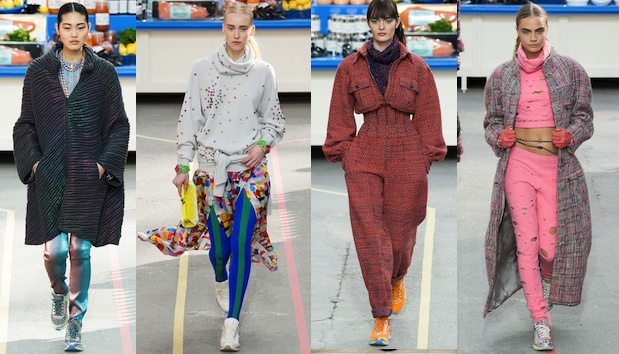 The show, which was elaborately designed to look like a supermarket, revolved around comfy attire and sneakers, channeling a blurb of fashion from the 80s. Chanel joins the likes of Alexander McQueen and Marc Jacobs in the sneaker revolution of 2014 and we can only guess that Miley Cyrus and Rihanna will be donning the uber-chic footwear on stage soon!